This workflow and test URL are provided to perform a quick validation check to ensure that ArcGIS Desktop systems work for TLS 1.2-only connections to ArcGIS Online. The URL provided here is not for testing all ArcGIS Online capabilities. It has been provided specifically for the Desktop client validation workflow described below. 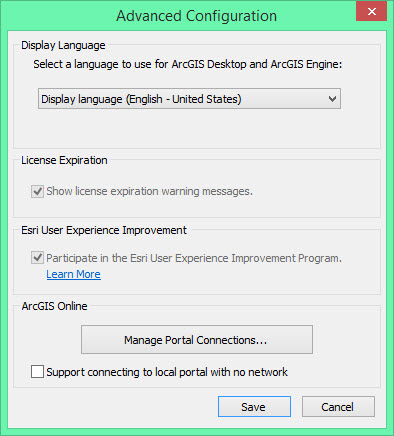 Launch the ArcGIS Administrator on any machine running ArcGIS Desktop version 10.6.1 or below. 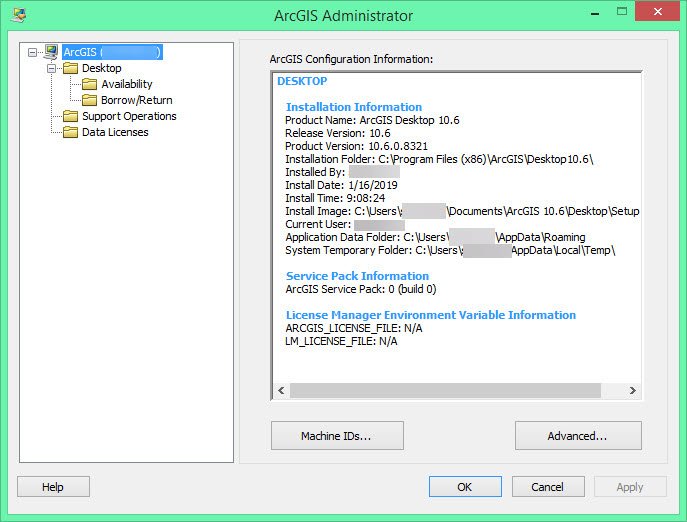 The ArcGIS Administrator can be accessed in Windows from Start > Programs > ArcGIS > ArcGIS Administrator. In the ArcGIS Administrator panel, click the Advanced button. In the Advanced Configuration dialog box, click Manage Portal Connections. 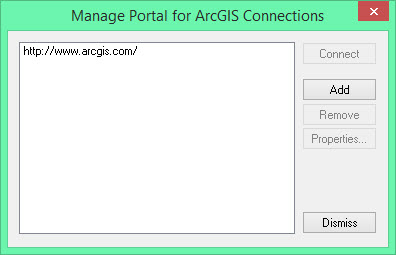 In the Manage Portal for ArcGIS Connections dialog box, click Add. If an error is returned stating "The URL specified does not appear to have a working Portal for ArcGIS", ensure that the option to Use TLS 1.2 is checked in the Internet Properties dialog box: Control Panel > Internet Options > Advanced > Security. Click OK, and in the Manage Portal for ArcGIS Connections dialog box, select the new connection, and click Connect. Click Save in the Advanced Configuration dialog box to save the new connection setting, and click OK to close ArcGIS Administrator. Launch ArcCatalog (not ArcMap). On the Windows tab of the ArcCatalog main menu, click Search. From the search options drop-down, select ArcGIS Online. Enter some text in the Search field, for example, states, as shown in the image below, and click the magnifying glass icon. Repeat Steps 9 and 10 above, and ensure that you can add data from ArcGIS Online. If a connection failure does not occur, the validation is complete and ArcGIS Desktop is set to work with ArcGIS Online through TLS 1.2 connections. 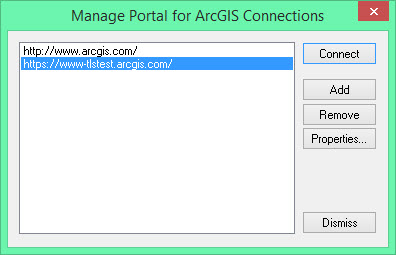 Once the connection to the test portal has been confirmed, be sure to reset the Portal for ArcGIS Connection back to http://www.arcgis.com/, or whatever default connection that is normally used (Step 6). FAQ: How do I enable TLS 1.2 on ArcGIS Desktop?